This presentation will consider the reasons for, and possibilities, of both liberalizing and radicalizing trends in modern Muslim societies. It will argue that ‘Islam’ needs to be understood as a complex of social relations and evolving political ideas. Neither the simple populist model nor the stark ISIS model is likely to prevail. 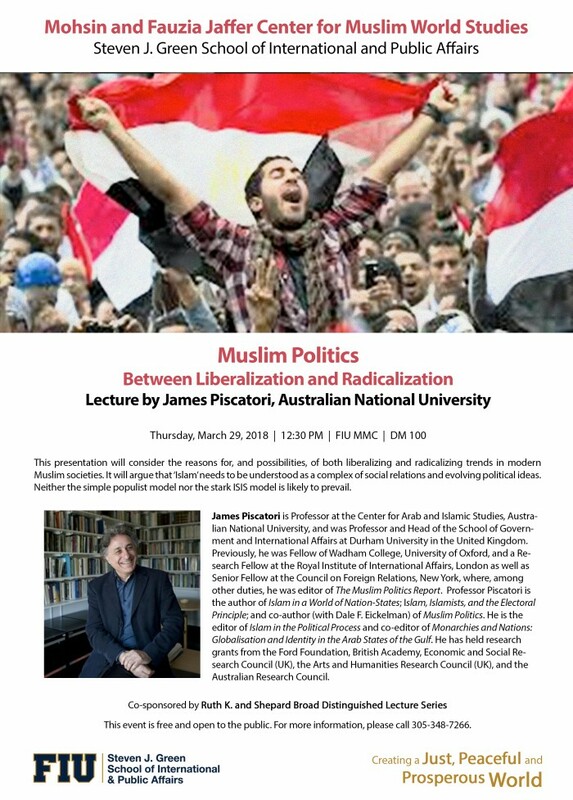 James Piscatori is Professor at the Center for Arab and Islamic Studies, Australian National University, and was Professor and Head of the School of Government and International Affairs at Durham University in the United Kingdom. Previously, he was Fellow of Wadham College, University of Oxford, and a Research Fellow at the Royal Institute of International Affairs, London as well as Senior Fellow at the Council on Foreign Relations, New York, where, among other duties, he was editor of The Muslim Politics Report. Professor Piscatori is the author of Islam in a World of Nation-States; Islam, Islamists, and the Electoral Principle; and co-author (with Dale F. Eickelman) of Muslim Politics. He is the editor of Islam in the Political Process and co-editor of Monarchies and Nations: Globalisation and Identity in the Arab States of the Gulf. He has held research grants from the Ford Foundation, British Academy, Economic and Social Research Council (UK), the Arts and Humanities Research Council (UK), and the Australian Research Council. This event is free and open to the public. For more information, please call 305-348-7266.